We have all wanted to look like Disney princesses at some point of time or the other. Remember the days when you read about Cinderella becoming a princess with a beautiful gown and you always wanted to dress up like her at every party of fancy dress competition? Those days can be relived now with designer salwar suits being given the look of princess like gowns. 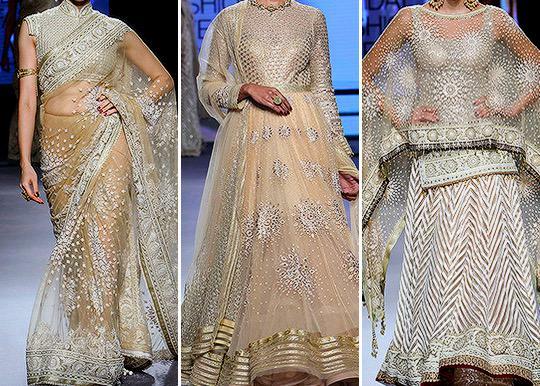 You may look like a royal Indian princess with Indian fabric and embroideries and also end up looking like a character out of some fairy tale because of smart western touches in ethnic wears. Here’s a tip for you all: When you wish to have a look like some character out of a fairy tale, choose designer anarkali suits with minimum zari embroidery and golden work. White stone work or thread work goes great for that look. Skip the dupatta and accessorize instead with princess braids and buns and hair bands. 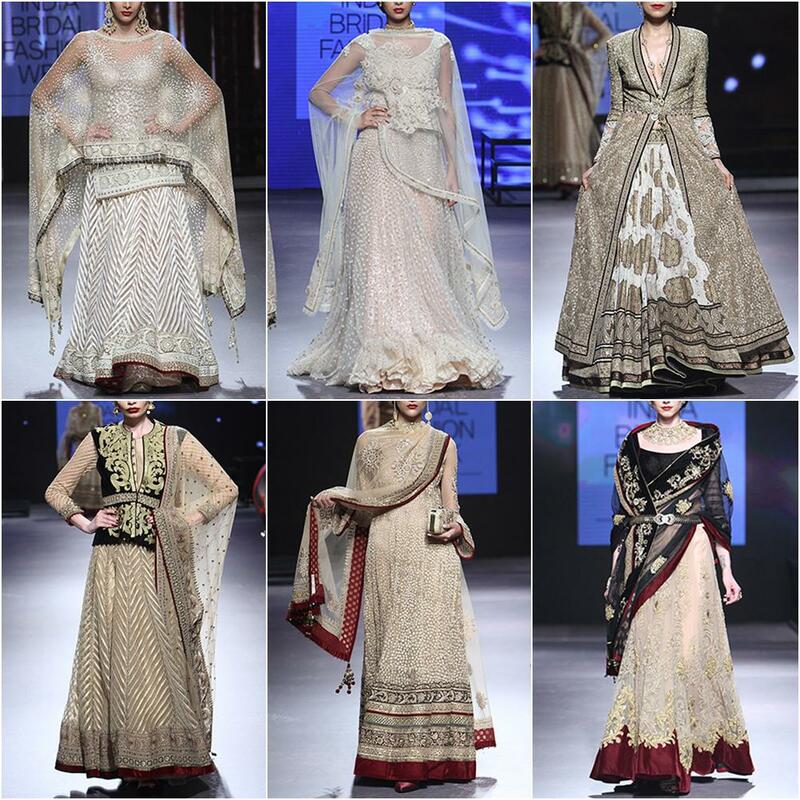 Bring in the rich fabric, heavy embroidery and zari embellishments when you want a typically royal Indian look. The georgette anarkali with a twisted hemline is one to look out for. You may have seen nothing like this ever. Forget the evening gowns and embrace the beauty of Indian fashion with this stunning blue Anarkali. 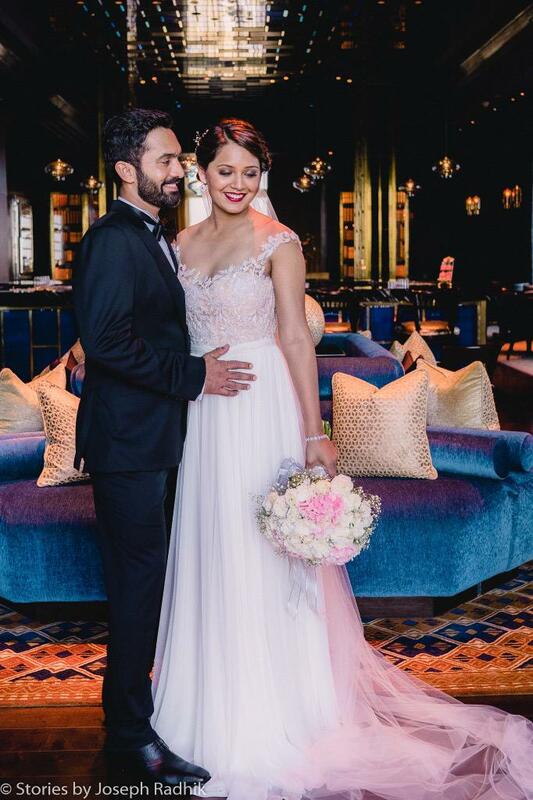 The full sleeved Anarkali is given a Western look with the minimum flare, gown like cut and baggy right half of the torso section. The left half and the left sleeve has mesmerizing golden machine work that can secure all gazes on you alone. 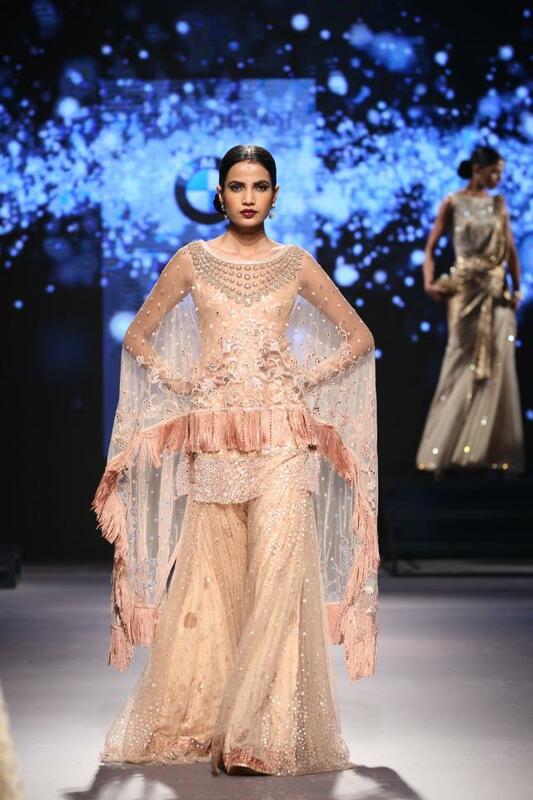 The dupatta even is not needed here as the suit itself is drop dead gorgeous and marvelously creative and unthinkable. Thread work is one of the classiest embroidery invented in India. It can give any outfit a royal, classy outlook and the same happens with this cyan, floor-length Anarkali suit. The huge flare makes this look like some good old European gown meant for princesses and royal ladies. The royal attitude is given an Indian touch with thin and intricate white thread embroidery all over the sleeves and bosom section. The lower half that spreads out stands beautiful in a soothing yet royal cyan shade. The hemline is once again bordered by white thread work that gives it an amazing outline. Skip the dupatta and team this up with pearls or diamonds and tie up your hair in a bouffant or top knot for the perfect princess like look. Blue, black and gold combine here for a stunningly marvelous look. Black and gold is a regal combination and the addition of royal blue makes things even more majestic. The black sleeves and torso with deep and intricate golden embroidery gives the Anarkali a highly gorgeous appeal. The section that spreads out like a skirt is kept plain to make the embroidered section stand out. 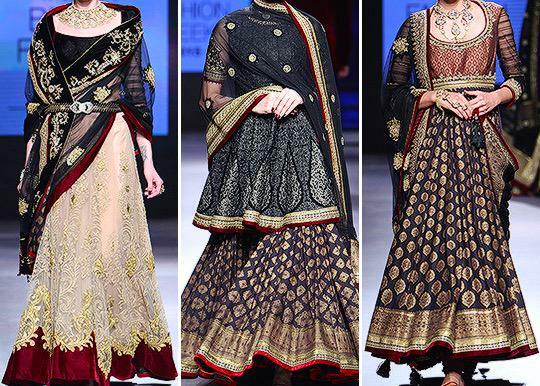 The hemline that touches the floor has another wide panel of black with intricate golden embroidery. 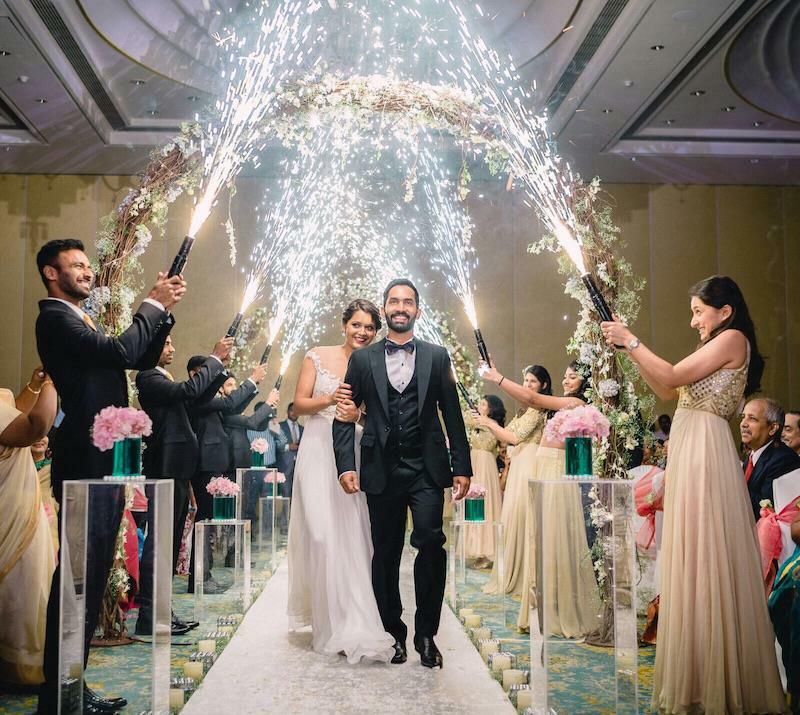 Overall, this one is a stunning suit that can end your indecision when you are confused about what to wear for the wedding ceremony coming up. Conclusion: Anarkalis are a variation of the Salwar kameez where the kameez spreads out like a long skirt. 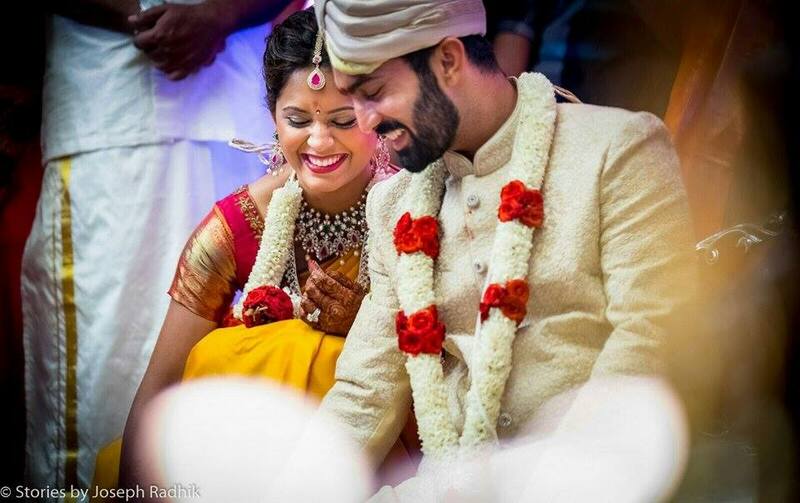 Anarkalis have turned out to be really versatile ethnic items. They can be plain and simple in medium flares till the knees or heavily gorgeous, extending till the feet. They may also have a western touch like a gown. Hair are one of we women's most prized possessions! We all have seen everyone from tiny school girls to teenagers and old women fret about their hair. Women are besotted to aiming for gorgeous hair from a very young age. It was my Grandma who instilled the love for long and strong hair in me. When I was in high school, I had the best hair in my class and a lot of my classmates envied me. While some sulked in their misery, somewhere real outspoken and asked me for long hair tips and methods. I found there was not much to tell them as the only secret behind my hair was dedicated oiling! Then when I moved to college, things took a different route. It was the age to explore and experiment and I found myself leaving my hair open all the time. What with all the studies and *ehem* extra hanging out with friends, I didn't find time to oil them regularly and attend to them. All was fun and cool until one day when I was getting ready for my second year Send off party. While I was hurriedly combing my hair and trying one of my hairstyles, the hair fall was more than one could imagine. Several locks of my beautiful, precious hair came out with every stroke of comb and I was left staring at the mirror and the heap of hair in my hands. That's when I realized that my hair had were very damaged and they had lost their original thickness and luster. Bestie ~ "Which Oil do you use Sweety?" Me ~ "Not one in particular Tass. I am not too choosy." Bestie ~ "God!! No wonder your hair our damaged. Never play games with your hair sweety! Give them the best care and be sure to use only one oil regularly." Me ~ "Which oil do you use? Guess it's pretty expensive! :/"
Bestie ~ "Haha! No! On the contary, it hardly effects your pocket while giving your the best care!.. I use Dabur Vatika hair Oil :). My whole family has been using it for years. You should try it too!" 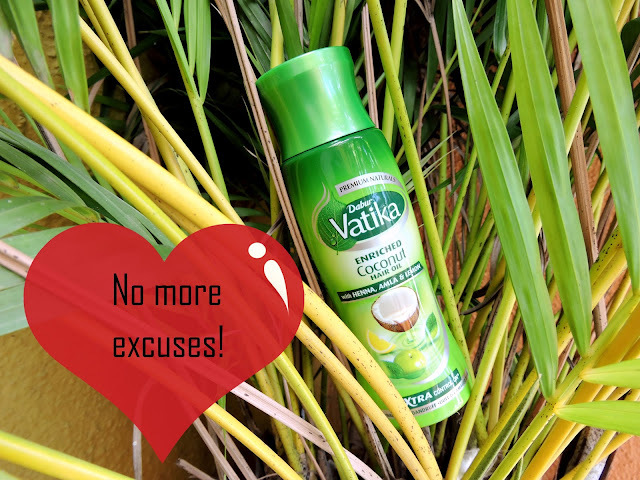 I have been recommending Dabur Vatika Coconut enriched Hair oil to all my loved ones ever since and today, I thought why leave out my wonderful readers! So here I am friends! :) Bid adieu to all your excuses for cutting short you hair as Dabur Vatika is here to repair the damage! It's the true elixir which nourishes and enriches your hair, giving it all the care it needs. Since the day I have started using it, my hair fall has reduced considerably and I haven't any point felt the need to chop my locks off. The texture of my hair has improved, not to mention the frizziness is gone totally. Totally recommend it to all you folks! I have been doing a lot of shopping of late and there are a lot of haul posts pending. The independence day sales meant i splurged on some palazzos , junk jewellery , beauty essentials and grocery too. Yes you read it right, grocery and that too online on my mobile shopping app called Peppertap. You know how the refrigerator is always magically stocked up by the genie called mom ? Last week my mom went visiting to my aunts place and three days later an almost empty fridge stared back at me . Shopping is like my best stress buster but grocery shopping is just not my thing. I hate sorting out vegetables and then getting them weighed and then again going and getting them billed in a longish queue. 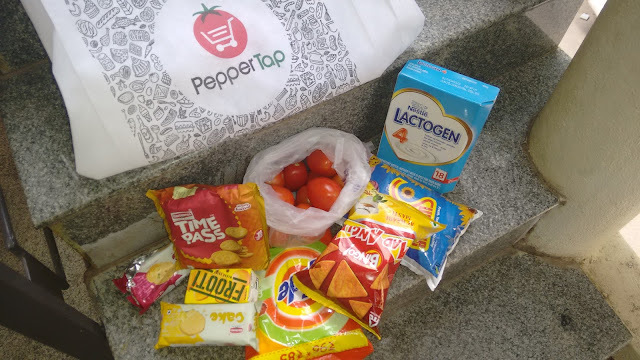 So to restock my refrigerator and essentials in my kitchen i decided to make use of services of grocery shopping mobile app peppertap which delivers at doorstep in under 2 hours. 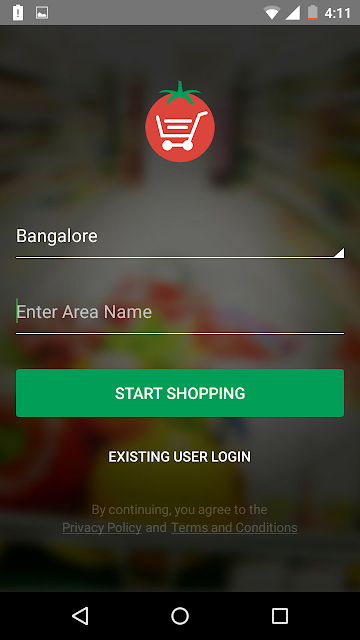 On downloading the peppertap app and opening it the first time i was asked about my city and locality. Then i went on to browse for products and i was impressed to find a good list of essentials and grocery products all neatly categorized into sections like Popular, Fruits and vegetables, food and drink, breakfast and diary, staples and spices, Bath and body , home and hygiene and Baby Needs . 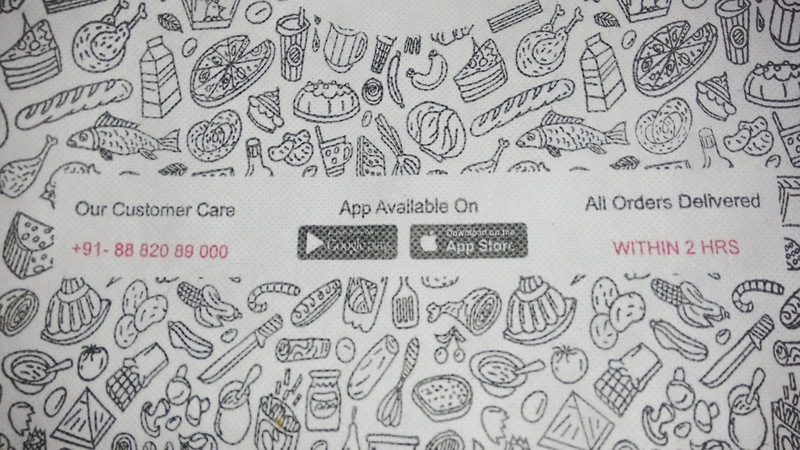 So everything from your Surf excel to amul butter can be ordered just with a few taps . There is also a search bar on the right hand corner on top which comes handy if you want to search for a particular products. Adding and removing products from shopping cart is as easy as pressing + and _ buttons below every product and the total gets reflected at the bottom of the list. Checking out and payment process is also simple and hassle free. You have to enter your details, choose a time slot or the earliest possible time (under 2 hours) and pay using your card or opt for their free Cash on Delivery service. Peppertap offers free delivery on orders above 250/- and on orders less than 250 or an extra Rs 50 delivery charge is applicable. My order was delivered on time and my stuff was packaged nicely in a peppertap branded bag. 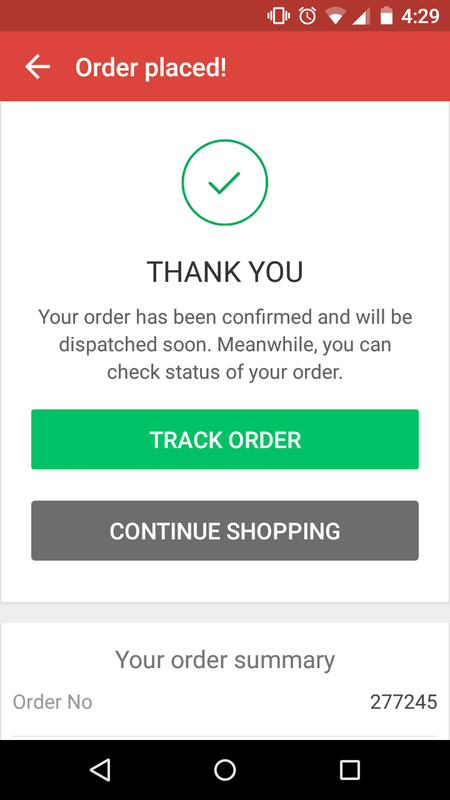 Honestly the under 2 hours delivery time is an amazing claim and i thought they will surely be late but again peppertap surprised me. 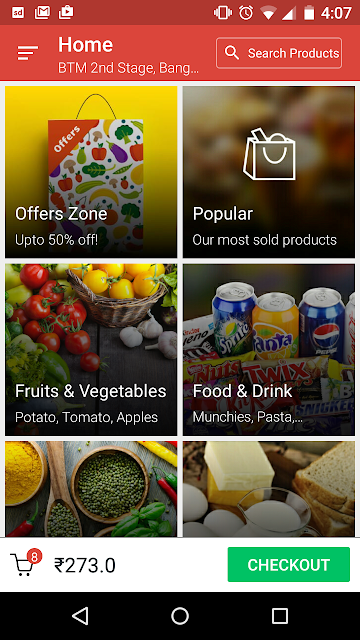 This app is a sure shot blessing for a person like me who doesnt like shopping grocery too much. It takes somewhere around an hour or 2 to beat the traffic, choose items and bill them off at a supermarket and when peppertap can deliver it to me in the same time frame minus the hassle, iam totally sold . Amazing Delivery speed of under 2 hours. Hassle free returns if you arent satisfied. 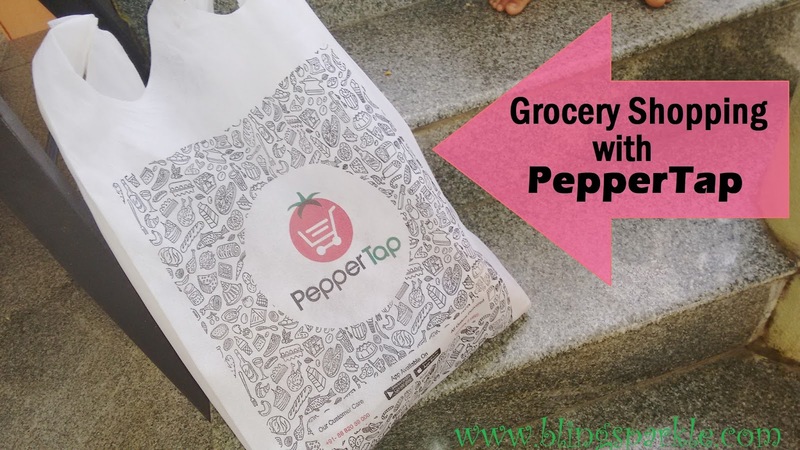 BlingSparkle Verdict : Peppertap has changed the way i do Grocery Shopping and has also reduced number of my visits to the supermarket. I totally recommend this app to all home makers and working women , just try this and make grocery shopping simple, fast and convenient. This app is a breeze to work with and even my mom now uses it so even if you arent tech savvy you will love the experience. Give it a try. Writing this post today reminded me of the good old days with Flipkart where there were sales so amazing that you couldn't get enough of them! Sadly, gone are those days, especially with Flipkart following the path by Myntra and going app only, all the excitement for shopping from them is dying. Actually, I am not a big fan of such boxes as I know from experience that one of the products in these is always stuffed in and a total disaster, which was true in this case too. But what urged me to buy it was that lipstick. A girl walks into an SS store to buy a foundation. All the time she's checking out what a particular sales girl is wearing on her lips. When she can't control it any more she asks the sales girl what she's wearing. (I know embarrassing). The sales girl is sweet and greedy too as she is trying to talk her into buying the lipstick too. The girl swatches that shade. Comes home without buying it. 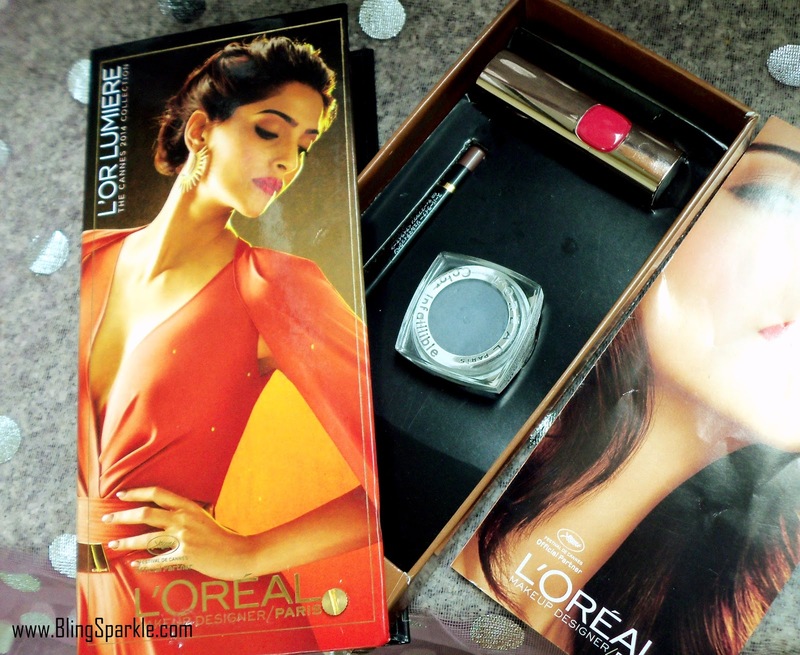 Yes, that girl is me and the lipstick shade I am talking about is the one hot shade which got a lot of fame, thanks to Aishwarya Rai who wore it with her Roberto Cavalli gown on Cannes 2014. 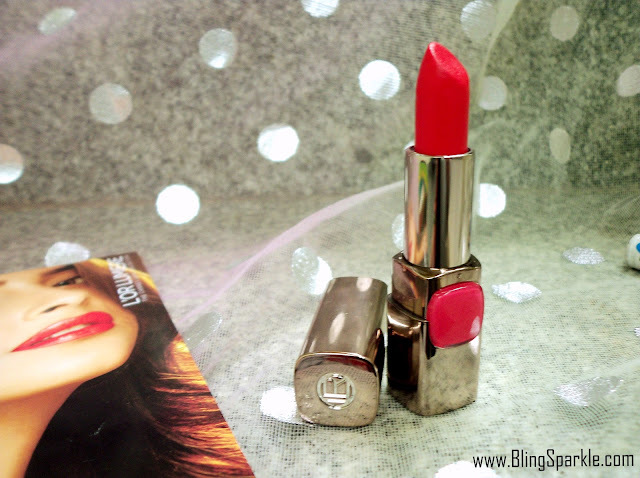 ~L'Oreal Paris Moist Matte Lipstick in Lincoln Rose(As shown in the above pic). I kept checking for its availability online as I didn't get a chance to go back to that SS store. The shade was out of stock everywhere. The only place it was available in was this beauty box. Finally, on a bright Summer morning, Flipkart came up with a 40% off on this box and I knew I had to buy it. 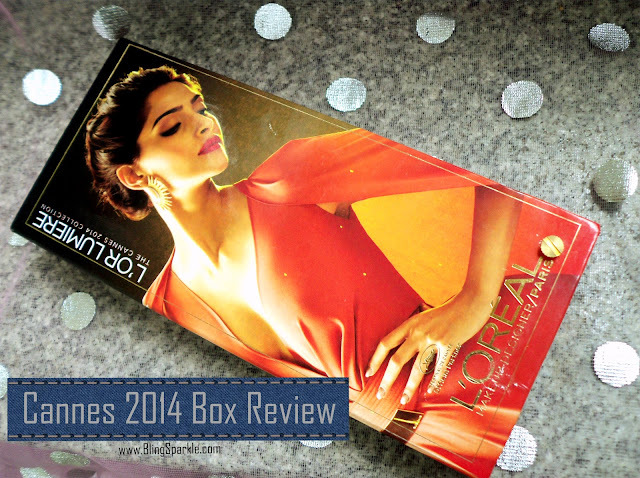 This box is inspired from one of Sonam Kapoor's Cannes 2014 looks and if it wasn't for that silver eyeshadow(which is pathetic), it would have been a perfect copy of Sonam's makeup on the box. Here are short reviews of all the three products in this box. It's a personal favourite and I totally love it! It was my HG red lipstick for a while until their new range of red lipsticks showed up. It gives you that perfect shade of Red lips to die for which look super hot, sensuous and drool-worthy. The Super Gel Matic liner in Deep Brown is THE BEST eye pencil I have ever tried! 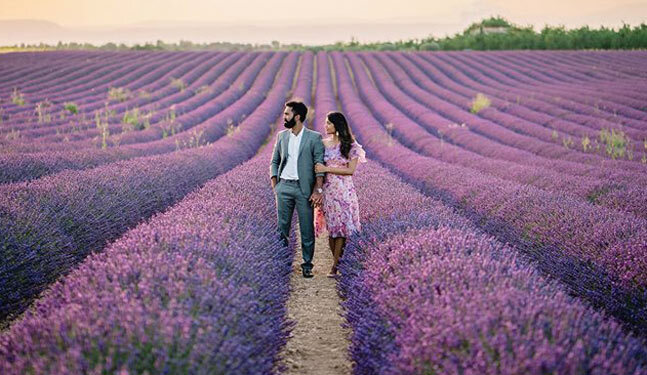 It's pure love and something which suits all occasions. This has become a wardrobe staple for me now. It's quite pigmented and doesn't sting your eyes and the staying power is also cool. A must buy. 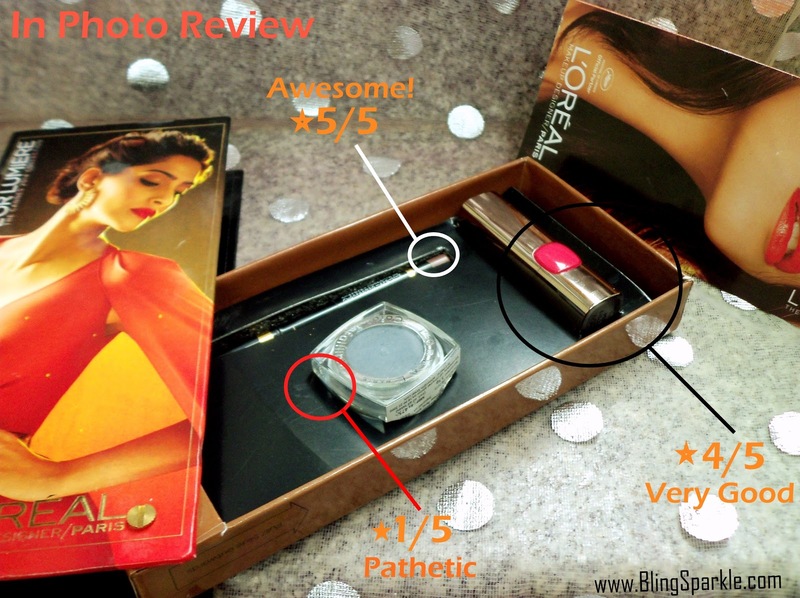 I am not too fond of L'Oreal's Infallible range and this was the biggest disappointment! PATHETIC is the word. - This shade looks ghastly. Like your Kajal has smudged and spread everywhere. If I hadn't got a 40% discount on this box, it would have killed me to have paid for this Infallible Eyeshadow in Pebble Grey. Overall, if you can ignore that eyeshadow and manage to get this box on a discount, it's an AMAZING buy! The packaging is totally cute where the upper box slides to reveal an inner box. It's perfect for gifting!